It is day three of the General Assembly in Vienna, there are no sessions directly relevant to your research scheduled in the programme for this afternoon and you would really like to take a bit of a break from the hustle and bustle of the main scientific sessions. Where do you head? Down to the Basement (Blue Level) and to the GeoCinema, of course! GeoCinema has been a regular on the General Assembly Programme for a few years now. The aim is to provide a platform for scientists to communicate their science via the medium of film; some of the movies are stunning displays of our beautiful planet whilst others focus on specific geoscientific or educational issues. It is the perfect place for conference attendees to kick back and relax whilst being taken on a journey to explore the wonders of the Earth and Space. This year a total of 39 films were screened over the five day period, but given the host of other sessions, talks and discussions available during the Assembly, it’s not surprising you may have missed the one film you really wanted to watch! A series of blog posts (GeoCinema Online) last year, brought the films right into the comfort of your own home (or office) and we’ve continued the series this year too. Over the next few weeks you can look forward to a series of posts which will showcase films and research from some of the most exciting fields across the Earth sciences. This week Saturn, the giant ringed planet and its moon: Titan take centre stage. A video was created using the images taken by Cassini probe of the Saturnian system since 2004. Too cold for liquid water, and yet it is a lot like Earth – tune into Titan’s secrets. Stay tuned to the next post of GeoCinema Online for more exciting science videos! Desert winds continually rework the sands on their surface, shifting grains up the stoss side of a dune to pile the sand higher… until the pile gets too steep and collapses under its own weight. This slipping of material along the front of the dune, allows it to move forward and migrate. The movement of the sand grains up and over the crest of the dunes is recorded in the internal structure of the dunes. Relatively thin layers of sediment which are seen to be at an angle with the dominant layering in the unit are known as cross-bedding and are the hallmark of a migrating dune. Cross-bedding can be generated by water or wind, all you need is a current that will transport sand over sediments. Large scale cross-bedding helps identify ancient dunes, as it is most often associated with flow travelling in a single direction resulting in the forward movement of dunes. Dunes can form in a number of environments: in river channels, on beaches and of course deserts too. Regardless of where they form, to continue to migrate forward they require a constant supply of sand. If that supply dies down and eventually stops the dunes stop travelling. In time, the layers of grains weld together to form lithified rocks which preserve the ancient structure of the dunes. 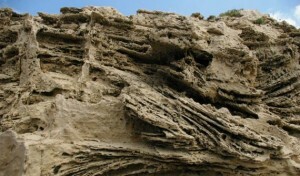 The picture shows a section of fossil dunes with the typical cross bedding internal structure that allows visual identification of this aeolian feature. “Fossil dune” by Jorge Mataix-Solera. This picture was taken during a research trip near Haifa, Israel, in 2008 and is distributed by the EGU under a Creative Commons licence. We are grateful to João Trabucho for helping us improve an earlier version of this blog post. EGU has a new Science Communication Officer! 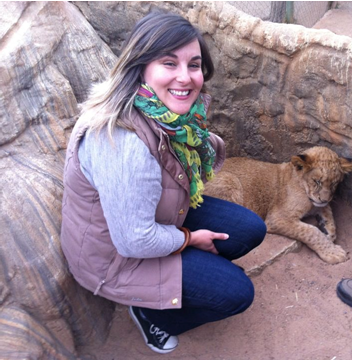 Meet the newest member of EGU’s communications team, Laura Roberts Artal! Laura will manage GeoLog and the EGU blog network, run our social media channels, and continue developing EGU’s networking activities for young scientists. It is a warm and relatively sunny day in Munich and I’ve just started as the new Communications Officer at the EGU! Some of you may recognise me, as I’ve been blogging as part of the EGU blog network over on Geology Jenga for approximately a year. I completed an undergraduate Masters in Geology at the University of Liverpool, where I investigated how and why magma/water interactions lead to typically explosive eruptions. Once I graduated, I spent three years in industry as an environmental consultant working on land contamination issues, before returning to Liverpool University to undertake a PhD researching whether the Earth had a magnetic field during the Archean, 3.5 billion years ago. During my PhD I have become an advocate for science outreach and communication. This has led me to regularly volunteer for the STEM Ambassador Network and Science Grrl, at outreach and public engagement events across the UK; designing and developing interactive activates for children and adults alike to raise the profile of Earth Sciences amongst the general public. Up until a few days ago Sara Mynott was the science communication guru here at EGU and I’ve got some very big shoes to fill! However, I am extremely excited by this new challenge and looking forward to spreading the word about all things Earth Science via the EGU blog and the wide variety of social media platforms that EGU has a presence in. To do so, I’ll be working closely with the EGU’s Media and Communications Manager, Bárbara Ferreira. Feel free to get in touch with me at roberts@egu.eu if you have any questions about the EGU or any of its publications – it would be great to hear from you!